WASHINGTON — President-elect Donald Trump is expected to name Goldman Sachs president Gary Cohn to an influential White House economic post, two people informed of the decision said Friday. Cohn, 56, would lead the White House National Economic Council, a posting that would require him to leave his $21 million a year job as president and chief operating officer at Goldman Sachs Group Inc. Trump repeatedly vilified the prestigious Wall Street bank on the campaign trail, yet with the selection of Cohn, he has now chosen three of its alumni to key positions in his upcoming administration. Steven Mnuchin, the Treasury secretary nominee, and Steve Bannon, Trump’s chief strategist and senior counselor, also worked at Goldman Sachs. The National Economic Council helps to coordinate domestic and global issues, providing economic policy advice to the president and monitoring how the White House’s agenda is implemented across the government. If Cohn accepts the nomination, he will also be the third Goldman executive to run the NEC. Robert Rubin was the NEC director under Bill Clinton, and Stephen Friedman had the job during George W. Bush’s administration. The two people informed of the decision spoke on condition of anonymity because they were not authorized to publicly discuss the expected move. Raised in Ohio, Cohn took a more circuitous path to Goldman. He graduated jobless from American University in Washington, D.C., and moved back into his parents’ home, according to a speech he gave at his alma mater. 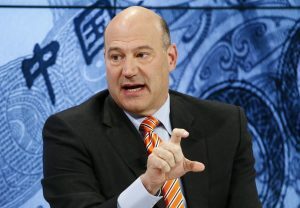 Cohn quickly found work at U.S. Steel to appease his father, only to pivot to a Wall Street job within a few months that eventually led him to Goldman in 1990. During the campaign, Trump repeatedly attacked his rivals over their Goldman ties. He criticized GOP primary opponent Ted Cruz for taking loans from the bank, where Cruz’s wife worked, to help pay for his Texas Senate race in 2012. And he chided Clinton for accepting large speaking fees from Goldman and for not publicly sharing what she had told the bankers. But Trump appears to have since changed his tune. AP writers Julie Pace and Julie Bykowicz contributed to this report.